Age of Warhammer: The Blades Of Khorne are coming!!! The Blades Of Khorne are coming!!! 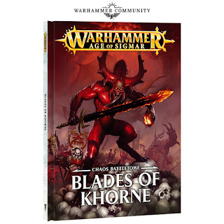 So we have been informed that there is due to be a new battletome called Blades of Khorne which is due to be released in April. This is going to be the Khorne equivalent to the Disciples of Tzeentch battletome which was released at the start of this year. I, as a future Khorne player, am very excited about this. Even though I have not read the Tzeentch battletome, I have read the excellent review that Kaelo Rylanus done which you can find here https://ageofwarhammer.blogspot.co.uk/2017/01/disciples-of-tzeentch-preview.html?m=1. This has got me very excited to the Khorne equivalent. We have been advised that no new models will be released, which I admit is a shame, however we have not long got that amazing looking Khorne demon model by Forge World, so I can't really moan that much lol. This codex... I mean Battletome will be a game charged for Khorne players! Heavy hitting infantry now a potential to be supported by DAEMON ENGINE FIREPOWER! I'm hoping the whole line of Khorne Daemons and Bloodbound are included in this... but also hoping for the Slaughterbrute as well as generic "old warriors of chaos" Slaves to Darkness! Excited to see the Battalions... special rules....: artefacts..::: and of course..... DRUM ROLL PLEASE COMMAND TRAITS. I feel for my friend who plays Bloodbound because there are so many potential models for the Chaos line and he is using old Allegiance Abilities and Command Traits from the Generals Hamdbook. So long story short I am excited for this CODEX really looking forward to it!